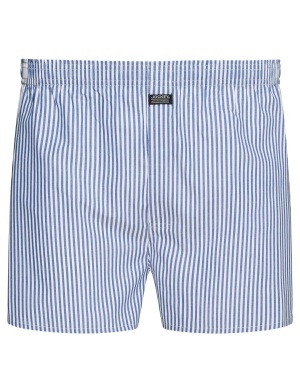 Top quality Jockey boxer short in narrow stripe contrast pattern. 100% cotton for a cool, comfortable fit. Sizes to 6XL. These striped Jockey boxers fit perfectly where the previous plain Jockey boxers did not. Hooray!!! 13 of 21 people found this underwear review helpful. Product arrived quickly and was as advertised. Very happy. 71 of 112 people found this underwear review helpful. Service excellent, but sizing not consistent with items bought several years ago. Goods returned and awaiting replacement. 167 of 301 people found this underwear review helpful. Husband thinks boxers are great, have already recommended the site to others. 181 of 374 people found this underwear review helpful. I found both product and service excellent and will place further orders in future. 200 of 372 people found this underwear review helpful.